The artistic Murano glass arrives in Paris to star in the big fair “Maison et Objet” to be held January 20 to 24 at the Exhibition Park Paris Nord, Villepinte. Paris once again hosts one of the largest exhibitions dedicated to the home, the international point of reference, as the slogan adopted for this edition, for the furniture industry professionals, fashion and interior furnishings and is the center of attraction for thousands of international visitors who find in this salon the best productions, news and trends. The artistic Murano glass will be present at this important event and will bring the best of excellence, quality, creativity and the Made in Italy. A six companies will participate, under the aegis of Promovetro Murano, one of Glass Brand manager Artistico® Murano Consortium established by the Veneto Region, with the support of Veneto Promotion – the Veneto Region. 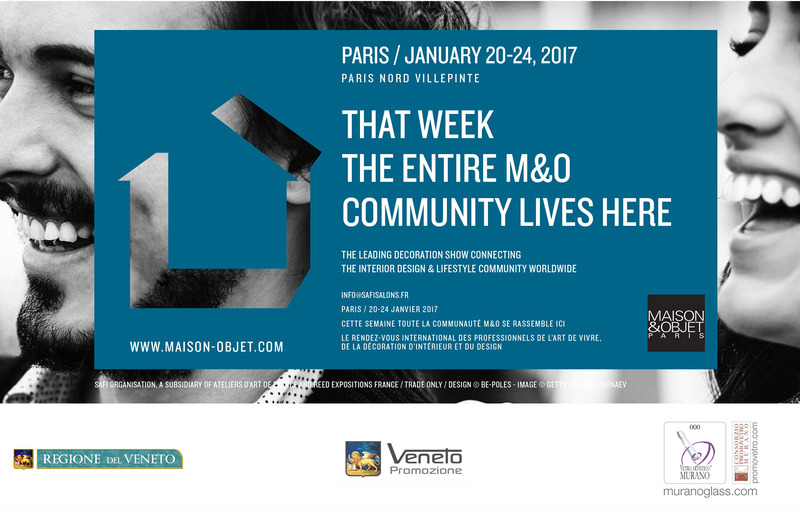 Founded in 1995 and reserved to the sector operators, Maison & Objet is held twice a year in January and September and is spread over an exhibition area of ​​135,000 square meters, divided into 8 pavilions.